With Magnet Commerce you can organise a newsletter campaign to keep in touch with your subscribers and further market your products. All you need to do is compose the content of the newsletter using the advanced editor provided and then send it to all your newsletter subscribers with the click of one button! 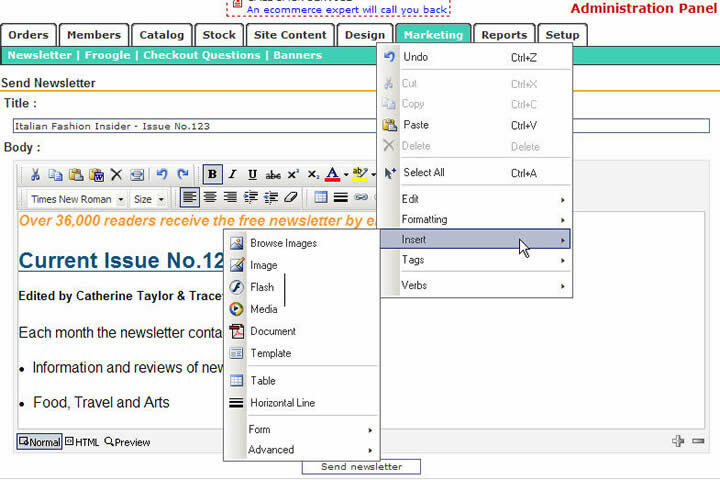 Figure: Use the "Marketing > Newsletter" tab in the Administration Panel to compose and send a newsletter to your subscribers. The newsletter page is split in two sections: A text box for defining a title and an editor for composing the newsletter. Title: Provide a title for your newsletter. This will also be the title of the email that will be sent to your subscribers. Body: Compose your newsletter using the powerful context editor provided. Once you have finished composing your newsletter, click on the "Send newsletter" button to send it to all your newsletter subscribers. Figure: Click on the "Send newsletter" button to send the newsletter to all your subscribers.
! Use the "Members > View" tab of your Administration Panel to see whether a subscriber of your store is entitled to receive your newsletters. Newsletter subscription box: You have the choice of adding a newsletter subscription box to the right bar of your store pages (simply choose one of the layouts containing the newsletter box from the "Design > Layouts > Right Bar" drop down menu). In this case a store visitor will automatically become a newsletter subscriber by providing his/her email and pressing the "+" button. Figure: A newsletter subscription box on your store front can be used by store visitors to subscribe to your newsletter. Checkout process: When completing an order your customers are given the option to subscribe to your newsletter by ticking the appropriate check box. Figure: A customer has the option to subscribe to your newsletter upon checkout. Figure: Your store members can access/edit their account information by clicking on "my account". Figure: A store member can change his newsletter subscription as well as all other account settings. Use the "Marketing > Newsletter" tab in the Administration Panel to compose and send a newsletter to your subscribers. A powerful editor is provided for composing a newsletter. Once this is done, the newsletter can be send to all your subscribers with the click of a button. Store Front: Your store visitors can subscribe to your newsletter during checkout or by use of the newsletter subscription box. 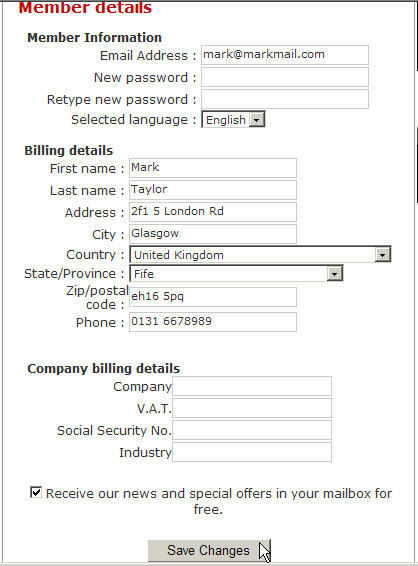 All store members can change their newsletter subscription settings at any time by accessing their account details.